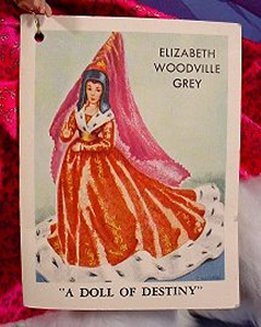 A "Dolls Of Destiny" ad in a magazine initiated a 50-year quest that still remains unresolved. 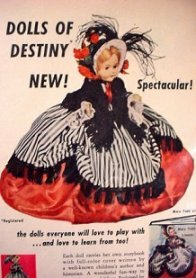 Circa 1953, A & H Doll Mfg created a series of dolls called "Dolls Of Destiny." Ladies fashioned after well known historical figures. 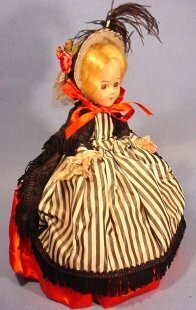 There are twelve dolls, each dressed in exquisite dresses which far surpass any costume for this type of doll. 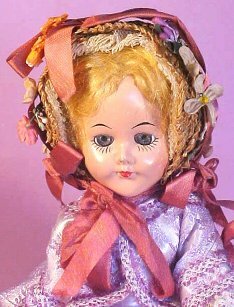 The dolls are all hard plastic, 12" tall with mohair swirled wigs and sleep eyes. The clothing is removable and very detailed. They have a delicate back snap closure. Brocade gowns with lace, gold braid, and accessories which add to the clarification of the identity of the historical figure represented. The bonnets or head attire are very detailed and elaborate. All of the dolls have a tag attached to the underside of their slips which states the identity of the doll. Advertised as "magnificently and authentically costumed to the tiniest detail"..........they are genuinely distinctive. 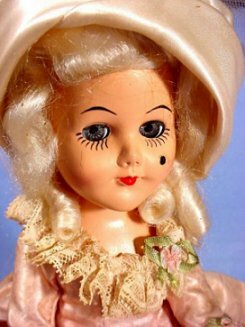 The actual doll used for "Dolls of Destiny" is not the quality used for dolls such as Toni or Mary Hoyer. Without the elaborate costumes, the doll will only bring a price of 10.00 or less in today's market. 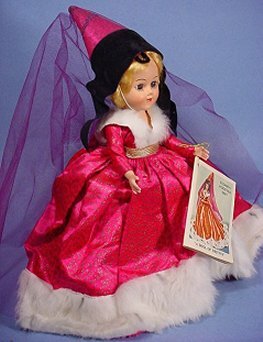 In the magazine ad, it is stated that "Each doll carries her own storybook with full-color cover..... written by a well-known children's author and historian". Marion Merrill and Helen Virginia Meyer are to be credited with these little history books. The books have a copyright date of 1953. 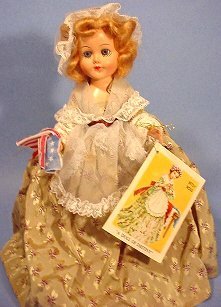 The half-page ad that created such a desire to obtain is in full color and pictures each of the dolls that were available. As a child, I did not believe $9. 50 was expensive. My parents, on the other hand, felt it was far too much to spend on such frivolity......and mainly because I wanted all twelve. But, after all.......this included handling and shipping charges!!!! 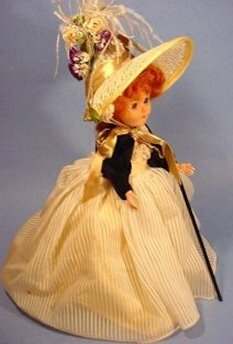 eBay has a rather large set of listings of vintage Hard Plastic dolls for sale, if you are interested in a purchase, or to find values if looking for costs, it is necessary to register with eBay. 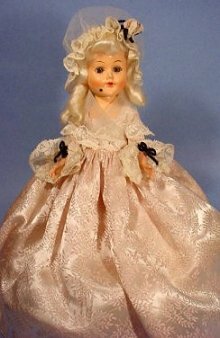 Blessed with the kindest stepmother a child could ever want, I was indeed fortunate that she convinced my father one doll would be within reason. A birthday gift to cherish. She is Marie Antoinette. 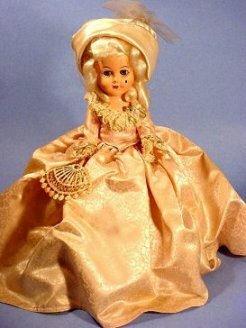 This is the only "Doll of Destiny" I received as a child. 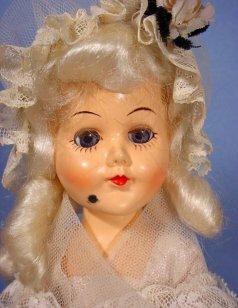 The applied velvet beauty mark on her face only enhanced her appeal. Years later when the flame of doll collecting was ignited, the search for the other eleven historical ladies began. 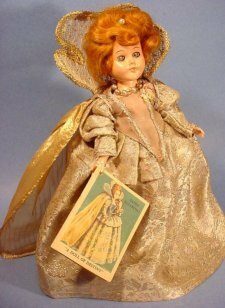 Following, I will share with you 10 more of the beautiful "Dolls of Destiny" I have had the fortune to acquire over the years. 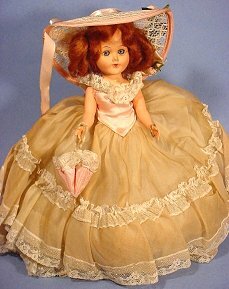 Priscilla Alden is one of the less flamboyant attired dolls, but her simple clothing still maintains the high quality of workmanship. She carries a hard plastic bible. Molly Pitcher has a gold "pitcher" tied to her wrist to accessorize her costume. Empress Eugenie has very full organdy skirt which is supported by a hoop slip. 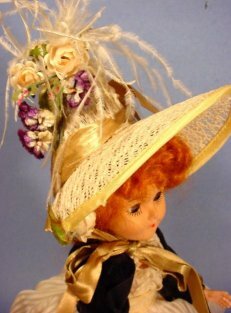 She carries an umbrella and wears a large picture hat. 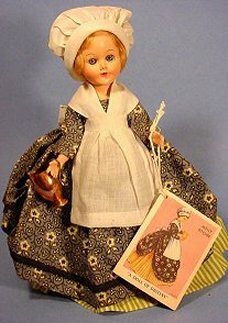 Some of the dolls have hoop slips, and long pantaloons are evident on all. Empress Josephine is one of my favorites. Her elaborate bonnet and walking stick to enhance her regal costume. Queen Elizabeth I, below, is wearing one of the more lavish gowns of brocade with a very stiff large metallic lace "collar." All dolls wear tiny shoes that tie and have stockings. Of course, Betsy Ross, on the left, has her creation of the flag to accessorize her outfit. The costume of Queen Isabella has long open sleeves and heavy gold braid trim. A lovely period costume of black velvet and stiff flocked taffeta. The very "first lady" and wife of the "Father of Our Country," Martha Washington has powder white hair and a mop cap. She also has the applied velvet beauty spot on her cheek. Her gown is satin brocade and white nylon organdy. I should mention that the boxes original to these dolls are quite large and have a blue brocade design overall. Mary Todd Lincoln wears a taffeta gown trimmed with fringe and a glorious bonnet. She also has a hoop slip. 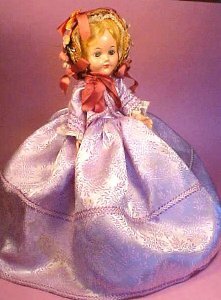 The one doll which I am still hoping to acquire is Queen Victoria. She carries an umbrella. She will complete the set of dolls which I admired in a magazine...........so long ago. NOVEMBER 14, 2005 UPDATE. An exciting week to say the least! 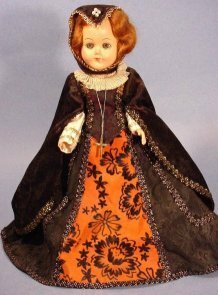 My sincerest and deepest heartfelt thank you to Marilyn in Illinois for her direction in locating Jill in Maryland.........and to Jill who provided an immediate adoption of the elusive Queen Victoria who completes my collection of Dolls of Destiny. Due to Marilyn's vast knowledge to search and Jill's willingness to part with her own doll from childhood.........these two exceptionally kind ladies have fulfilled my longest existing dream. Words can not describe the joy.......and above, here is Queen Victoria. Welcome to "Show and Tell" for DOLLS OF DESTINY! We all love to share. If you have photos and information on these beautiful DOLLS OF DESTINY, please fill in the form below to "Show and Tell" any of your favorite 12 early DOLLS OF DESTINY. We all have an interest in how they were located, the use of materials in their clothing and anything else you would like to share with other avid collectors. 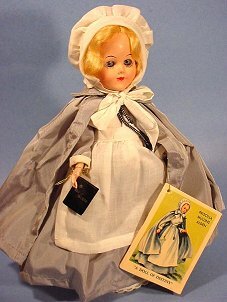 Unidentified A & H Doll of Destiny? Thank you for your website & wealth of information.